Hey, everyone! I just wanted to post some photographic evidence that I met Kendi from Kendi Everyday today. She was in town visiting her best friend who lives in Austin. She has been one of my favorite bloggers for a while, so finally meeting her in person brought out the sillies in me! (from L-R) Amy from Pixiespace, Kendi from Kendi Everyday, a random pregnant lady, Grechen from Grechen's Closet, and Sydney from Basic Cravings. 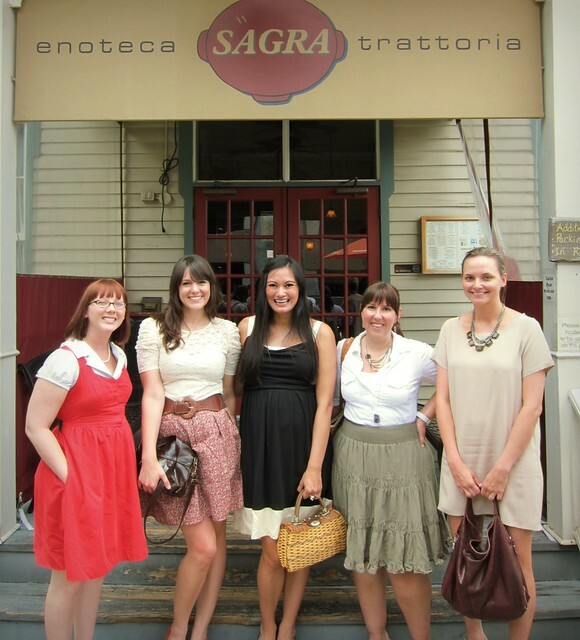 We were all at Sagra for Plain Ivey Jane's fashion brunch. I also got to meet Amy (Kendi's bestie) for the first time (recently seen as #13 in the Aloof Blogger Pose-Off) and right after this photo was taken we all met Bianca, an Adored Austin and Kendi Everyday reader! What a great afternoon! Can I just say for the millionth time on here that I love living in Austin?